Double Ka Meeta is my Diwali gift to you this year. Happy Diwali to all my dear friends. It is the festival of lights and sweets. From the newspapers to the shops everywhere it is “Sweets ka Dhamakka”. Look at the many different varieties of sweets; it is temptations galore for all the sweet lovers. So, I am in a sweet mood today and wanted to make this sweet dish called “Double Ka Meeta”. The first time I had Double Ka Meeta in Dubai, at our friend’s home. Jebin, our friend, is a great and dedicated cook and has a Midas touch. This sweet dish she made was so delicious and soon it became one of our favourite desserts like Trifle delight, Apple Biscuit crunch, Tender coconut/ ilaneer pudding and Chocolate Brownie. 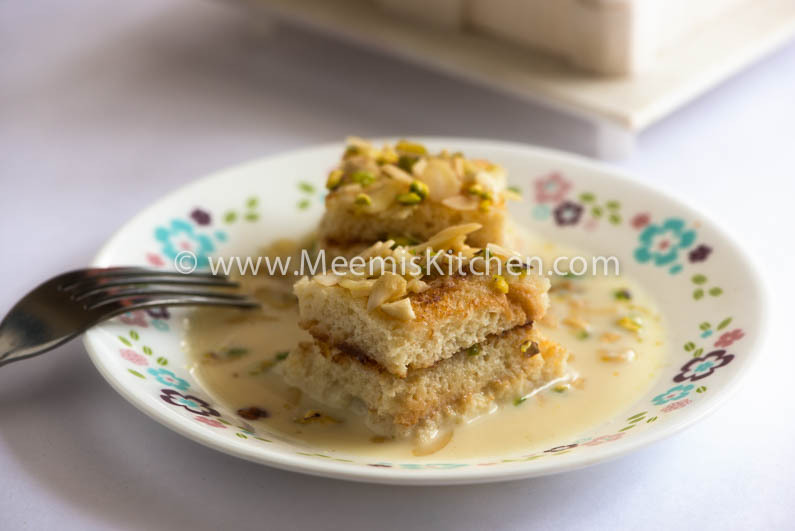 “Double” is another name for Bread and so Double ka Meetha is a Bread pudding dessert of fried bread slices soaked in sweetened milk with nuts and Saffron. Let me warn you, once you have it, you would certainly come back for more. Indians love sweets and Laddoos, Jalebi, Peda, Kheer are all very popular. Each region has its own unique sweets. In Kerala, varieties of Payasam like Palada Payasam, Pumpkin Payasam, Sweet Potato Payasam, Ada Pradhaman, Parippu Payasam etc. Hyderabad’s Double Ka meeta is famous like its Hyderabadi Dum Biriyani. This is a very rich dessert with ghee, sweet and the rich nuts that, too much indulging would make you run to the gym for extra work out. It is my Matthew’s favourite dessert, so I always make little quantity at home, to avoid too much temptation. But then, it is Diwali time, forget about dieting and start eating. Gym can wait, but “Double ka Meeta” can’t. So are you ready for the sweet expedition?? Spread the bread pieces in a plate to dry for 10 minutes. Cut the edges of bread slices and cut into small square/ diagonal pieces. In a Tawa, toast the bread pieces with ghee (Original recipe calls for frying in ghee). Boil the milk, add condensed milk and enough sugar and simmer for few minutes. Powder the cardamom seeds and add this to the milk. 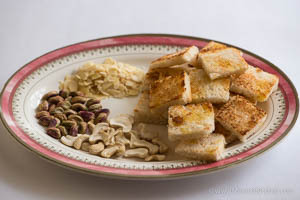 Crush the cashew, pistachios, almonds (get grated almonds if you can). Layer the bread pieces in a shallow dish and pour enough milk mix to cover and layer with crushed nuts, again with bread, milk and nuts. Layer the remaining nuts on top and sprinkle saffron. Serve hot or cold. Enjoy!! Try to get grated Almonds, as it tastes better than crushed ones. Pistachios should be unsalted. You can add kismis (raisins) or other dried fruits for variation. As per original recipe, bread pieces are fried in ghee, I am toasting to cut the amount of fat. Still it tastes fab. Adding Saffron is optional, if you don’t like just avoid it. This dessert can be served warm or cold. Always use old bread as it absorbs less ghee than fresh bread. Have a great sweet Diwali!! God Bless! !